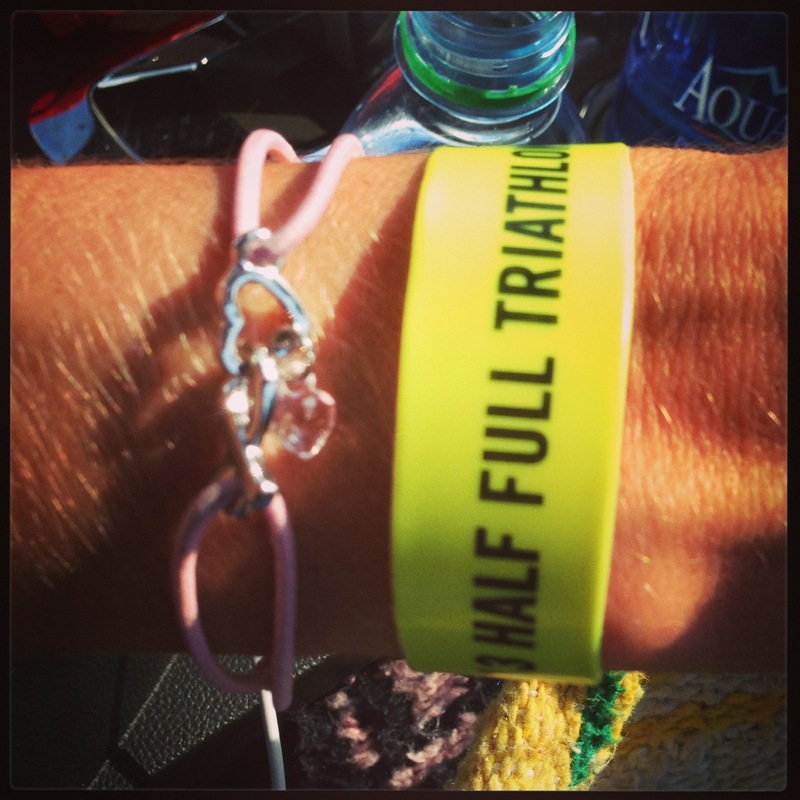 Quick flashback to October 2012…I was here before and experienced my first and hopefully only DNF. It was cold, it was raining, and I injured myself in the first 5 seconds of the race by slicing my foot right open on a rock as I entered the water. After pushing through the swim and then the bike to mile 34 with a nasty, stinging cut in the middle of my foot, I brought it in and went home. One bloody sock and one tetanus shot later, DNF. Here it is 2013, and I am ready to take on this course. I was planning for cold, rainy weather again. I had purchased all kinds of cold and wet weather gear just for this race, so why wouldn’t it be clear skies and 90 degree temps? My crew (daughter Samantha) and I drove up the day before for bike check-in and checked out the expo. I can’t help it I’m a sucker for expo shopping, but I scored some great stuff. 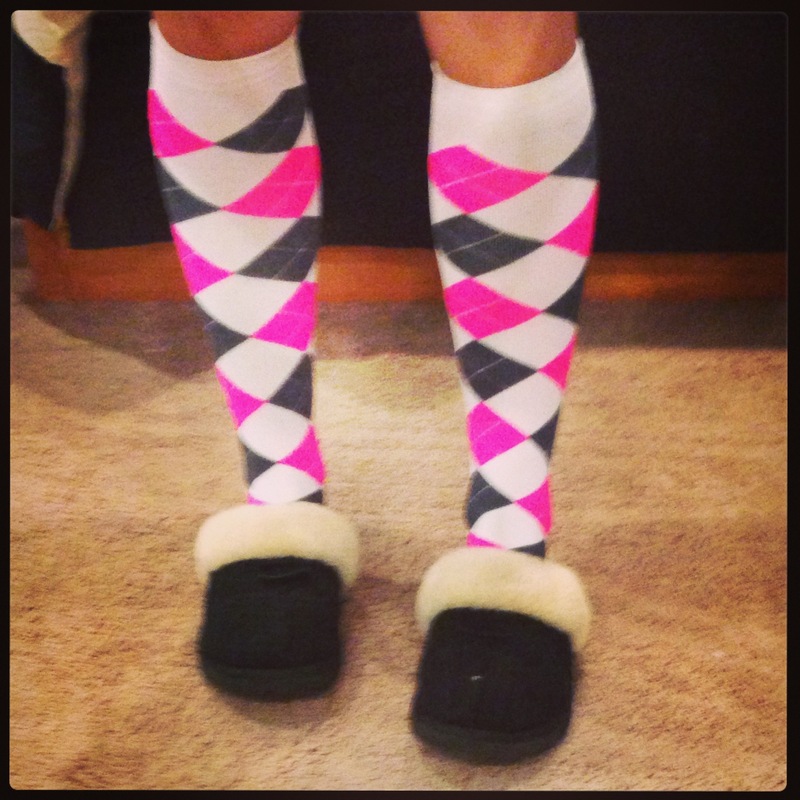 My new Zensah compression socks. My new favorite coffee mug. Got banded, picked up my goodie bag and numbers, and dropped off my bike. This year’s swag included a nice mock neck technical shirt. I didn’t feel the need to stay local, since the drive was only an hour. We got as close as we were going to get and ended up parking on the street right by the entrance to Centennial Park. I immediately headed over to transition and setup my area. Although the water temps were wetsuit legal, at 6:00am I was already feeling the day warming up. My daughter and I were fortunate to some have great friends from Team Z to hang out with before the race. Especially one that knows how to take some great pre-race picks. 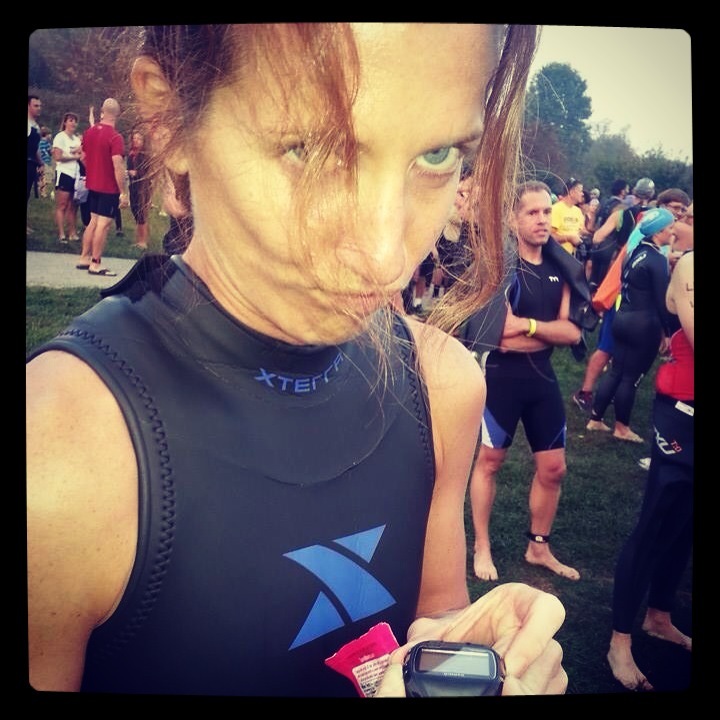 So during our pre-race shenanigans, I discovered that my Garmin decided it wasn’t going to work for me. Every time that I would push the power button it vibrated and gave the message “SOFTWARE LOADER.” Seriously, what does that mean?! I cannot race without my numbers! My OCD will simply not let me do this and keep my sanity. Oh my goodness, thank you Erica for saving the day! Awesome friend Erica was only racing the swim leg on a relay team and was not using her Garmin was gracious enough to let me borrow hers for the race. Crisis averted! 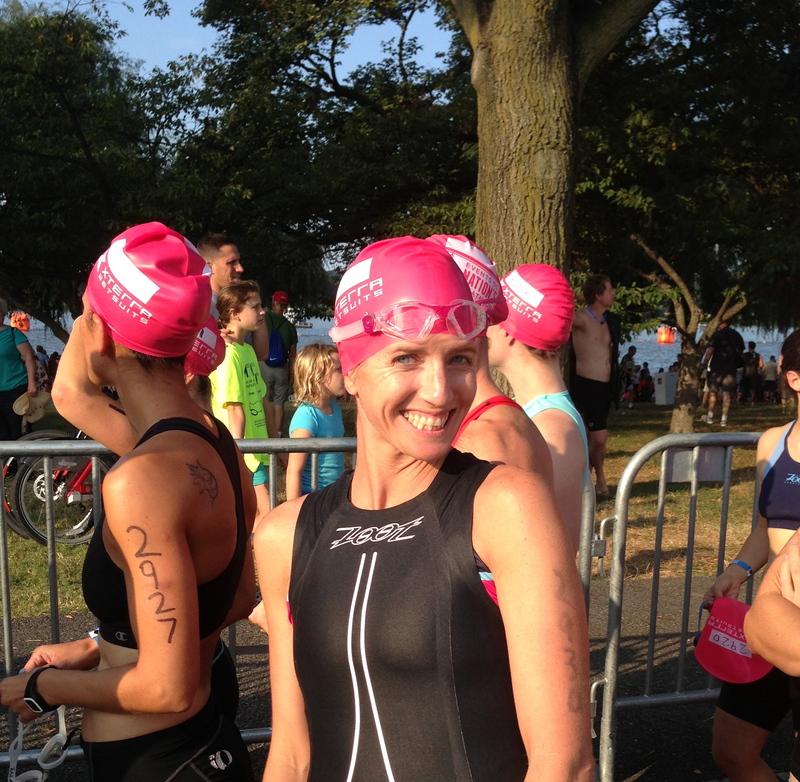 Once again, as with so many other races, my swim wave was close to the last, 4th from the last to be exact. My swim was okay, but I had already decided that one of my focuses during the off-season is going to be swim work. The course was well marked, however I should have worn tinted goggles since we are swimming into the sun. This also makes the far buoys hard to see. Although my time wasn’t great, I consider the course successful since I didn’t cut my foot on entry. Swim time: 30:40. My T1 time was not good. My daughter needed the keys, which happened to be in my gear bag, to get into the car. I told her to be at the bike out exit and I would throw them to her. Other than this delay, transition went smoothly. T1 time: 5:11. This was seriously the hilliest bike course I have experienced. It was tough. The most popular phrase I heard on the course was, “Dropped my chain.” I was included in this mix…twice. There was one hill, I don’t know at what mile it was, but thank you to the group that was partying on the hill and cheering the athletes on. Yes, the man in the dress and wig, I’m talking about you. Hills and roundabouts describe this course well. I don’t think that I’ve driven a car through this many roundabouts in my life. The course views were spectacular, a lot of beauty up in Maryland. Two loops later, I was so happy that I was done with those killer hills. Just before I turned into transition, I saw Samantha and Tracy (T-racer girl) taking pictures at the turn. 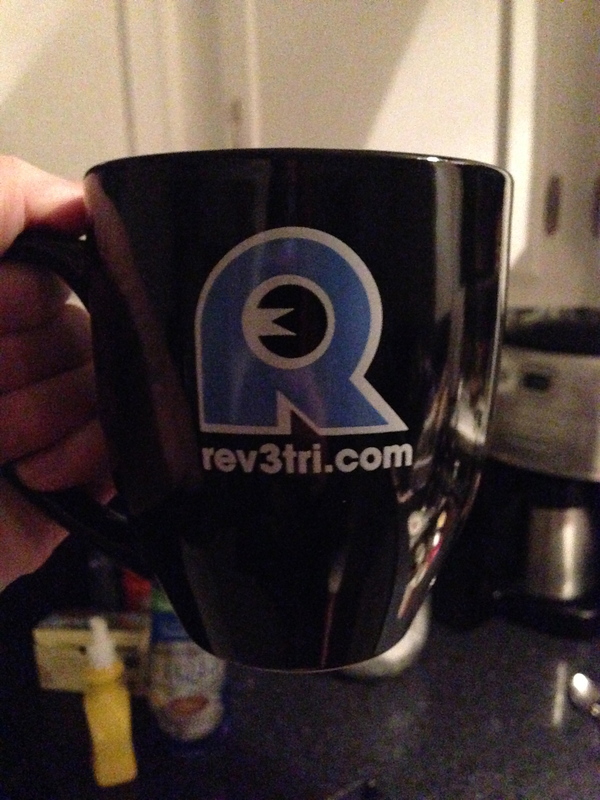 Tracy caught my shout out to Rev3. Ok, it was hot, REALLY, REALLY HOT. I moved in and out of T2 in good time. I grabbed my Gu and I was out on the run. T2 Time 3:19. At this point, last year’s weather would have been welcoming. It was so unbelievably hot out. About ¼-mile out of T2 I got a cramp in my side that took me a few minutes to work out. Hills, hills, and more hills once again. It was so hot and I couldn’t cool off well, so my plan was to walk through the water stations and run in-between. I think that my running up the hills though was more like scooting. So happy that there were plenty of aid stations with water, ice, and Coke manned by some awesome volunteers. Coke? Yes please, at every other station. But seriously, it was hot. The run took forever. I was so happy to finish the first loop of the run. How happy? There is pain behind that smile. Ran through the finish line with Samantha. She is my biggest fan, and my greatest supporter. Run Time: 2:31:13. I would rather not talk about that run time, it was bad, I was slow. This was truly a great race, for such a great cause. 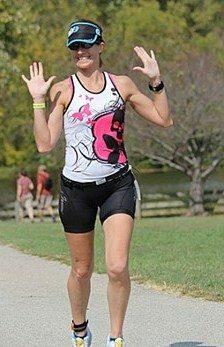 With last year’s DNF in the back of my mind throughout the race, I was so happy to finish. The course was covered with awesome volunteers and law enforcement support. 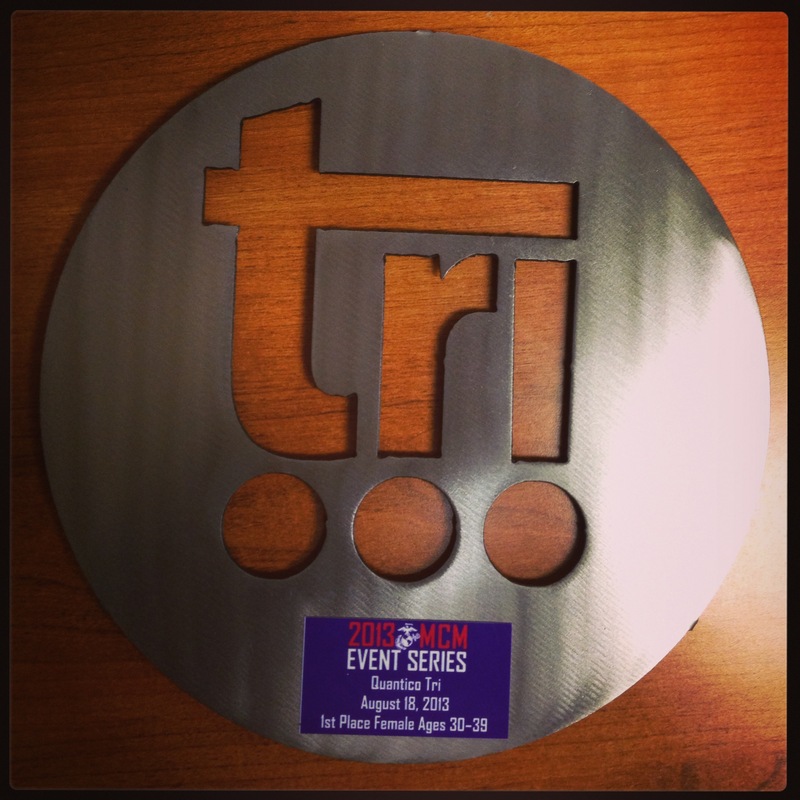 You know when Revolution 3 Triathlon is a sponsor it’s going to be a great race. I will be back next year! Samantha got to place the finisher medal around my neck. 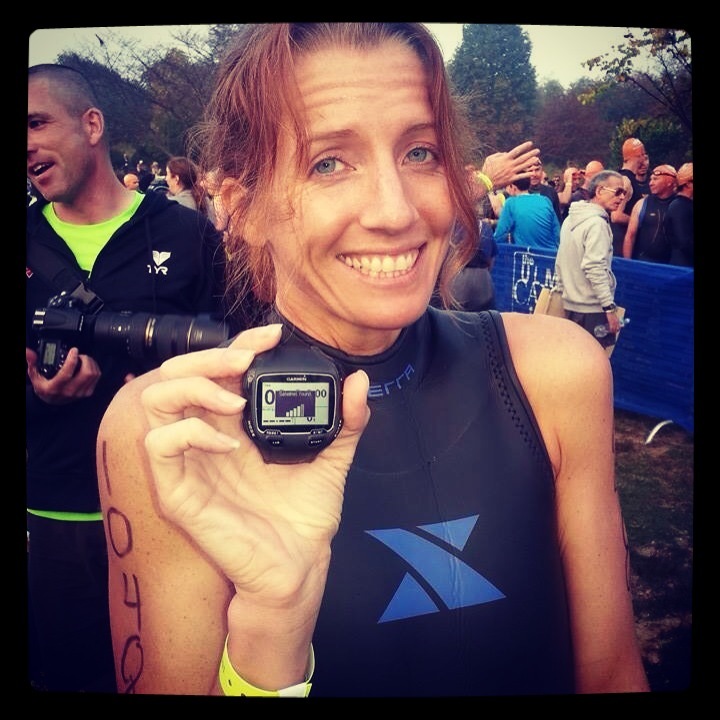 This entry was posted in Triathlon and tagged bike, Garmin, half full tri, Rev3tri, Revolution 3 Triathlon, run, swim, triathlon, ulman cancer fund on October 22, 2013 by usmctriwife. 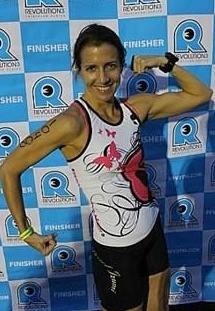 This entry was posted in Triathlon and tagged age group, bike, race, Revolution 3 Triathlon, run, Set Up Events, swim, triathlon, USAT on October 19, 2013 by usmctriwife. 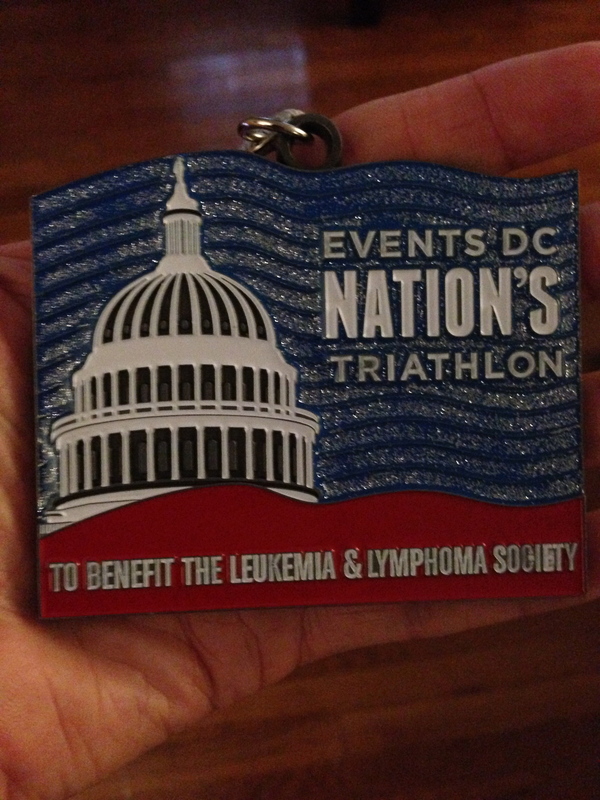 On Sunday, September 8, the 8th annual Nation’s Triathlon was held in Washington, DC. 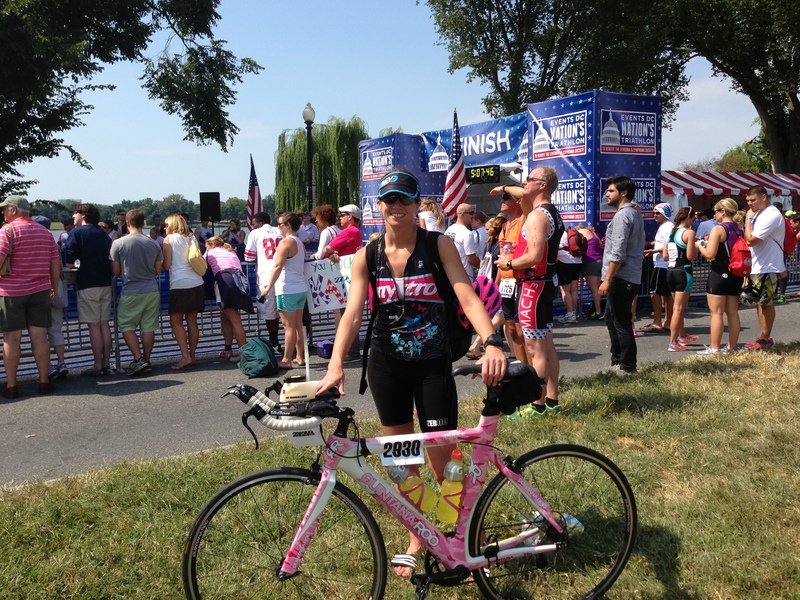 What an awesome experience to race in our Nation’s capitol. 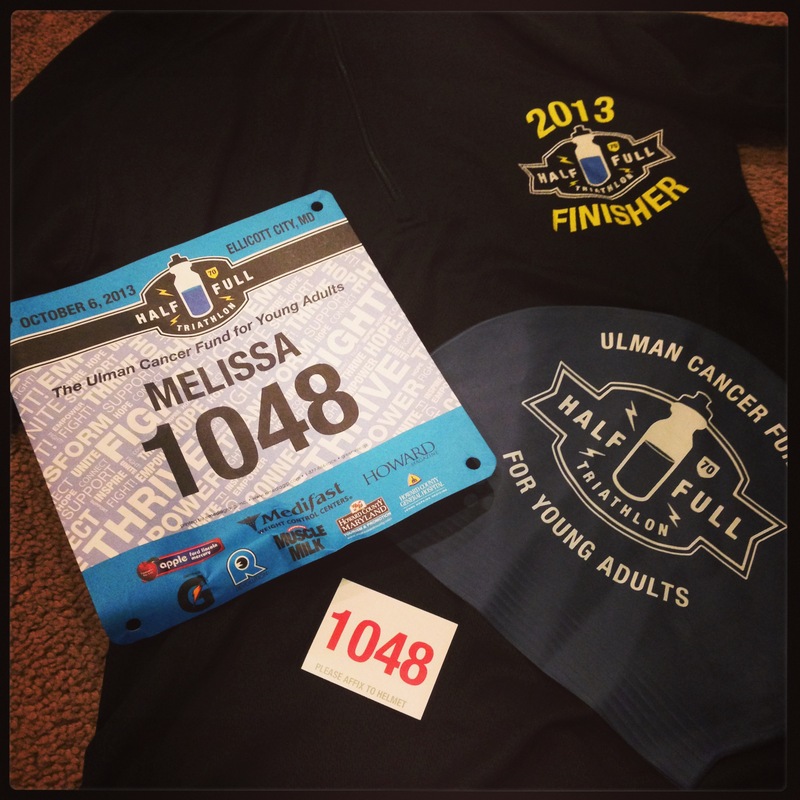 The race benefited the Leukemia & Lymphoma Society, represented by Team in Training. 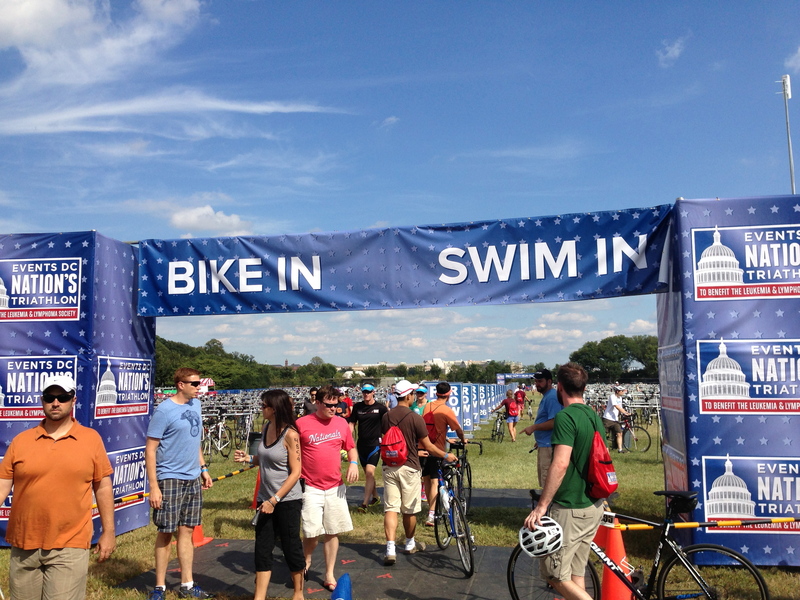 Starting in Potomac Park, the international distance course (1.5k swim, 40k bike, 10k run) took athletes by many of DC’s historic landmarks. The REI Sports & Fitness Expo held at the Washington Hilton was awesome. A lot of great sponsors and vendors showed which means lots of samples and a little bit of shopping (REI, Revolution 3 Triathlon, Power Bar, Gatorade, and Team Z to name a few). 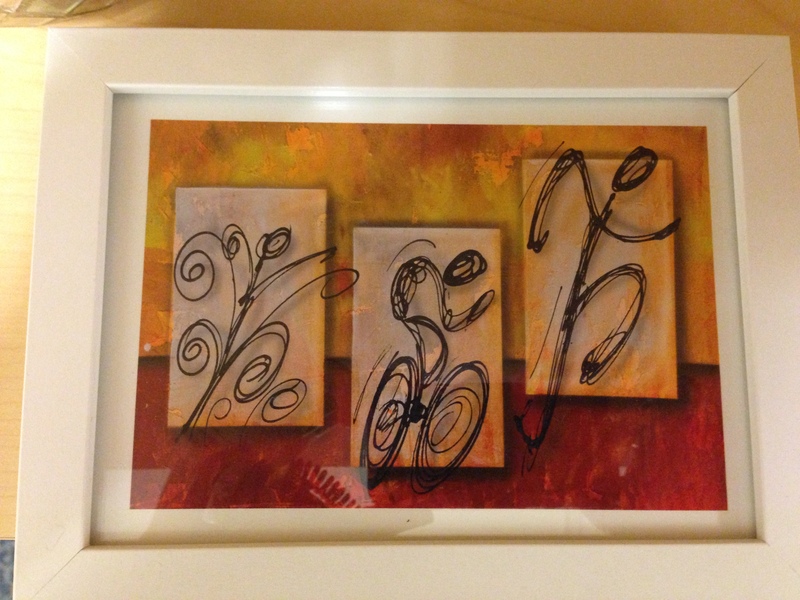 My favorite triathlon expo purchase of all time was made here, my framed triathlon art by Alejandro Maldonado. How cool is this? After the expo we navigated through downtown DC to drop off Miss Pink at Potomac Park. I really, REALLY have a strong dislike for roundabouts, and DC is full of them. Just saying. Racing in the Nation’s capitol provides a lot of fabulous views, even walking from parking to the transition area at 5:30am. Parking wasn’t as bad as I thought it would be, but as always the early triathlete gets the parking spot. We were super early to transition, and I was able to get setup rather quickly. So, I’m setting up my area, and I notice that no one else has out their wetsuits. The water temp announced at the expo was 74 degrees, how did the water get warmer overnight? Oh well. Luckily, I also had my Zoot Speed Suit with me. By this time it’s 6:30am and I am done with setup, the first wave doesn’t start until 7:00am, and I am wave #27. With 8 athletes entering the water every 15-20 seconds, I have quite a bit of time, however I didn’t realize how much time. Seriously though, I didn’t realize how much time. When we were in the chute, the first finisher was coming in. It was just after 9:00am when we started. I’ve never done a swim in the Potomac River before, but I have heard people say that it would be a dirty swim. It wasn’t that bad. 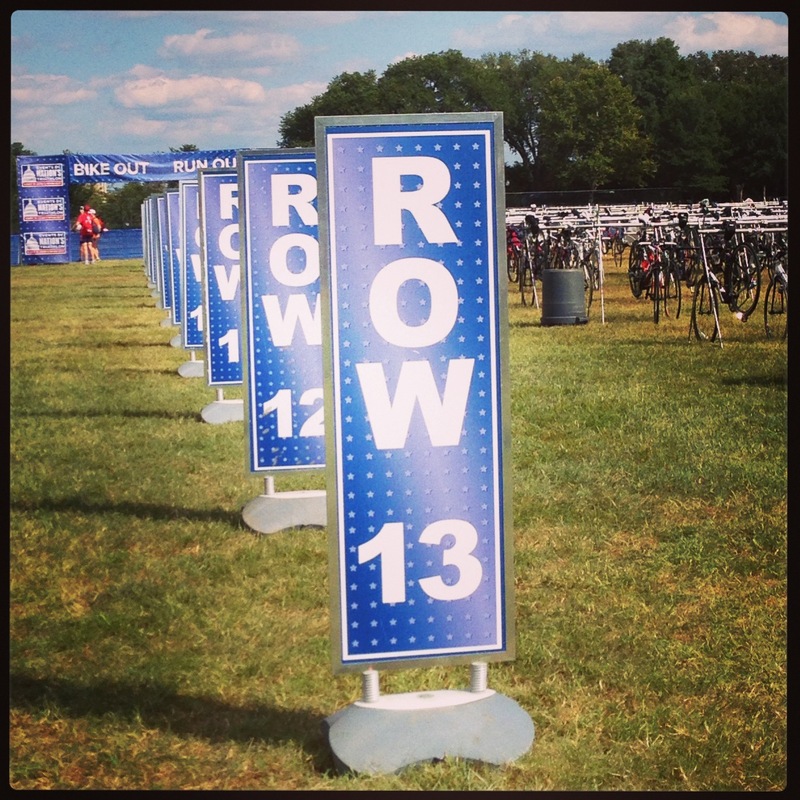 The swim course was the BEST marked course I have ever seen, buoy markers every 100 meters. So, if I’m being totally honest with myself, my swim training was quite lacking. I was not following my swim program as I should have been which is shown by my time. I wasn’t struggling by any means and I did okay, but I was not impressed with myself. The water was smooth with a few ripples. Finished in 30:37. The transition area is a short hike from the swim. It is across a paved road and there are a few rocks to be aware of as well, so step carefully. 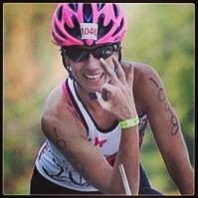 I truly loved how well the course and the transition area were marked. 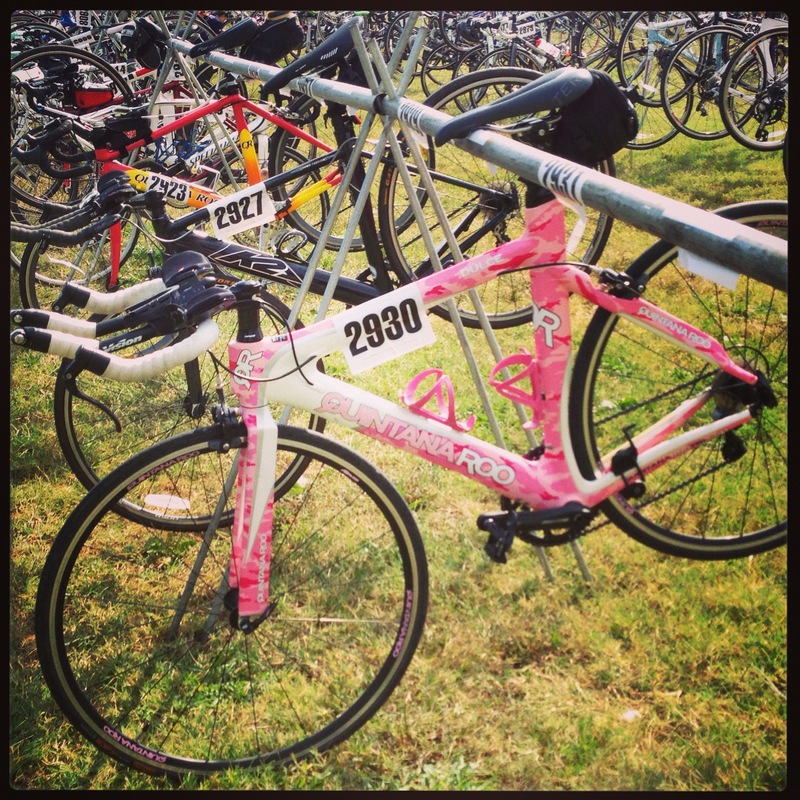 It made it very easy to find my bike and head out onto the bike course. My T1 time was 2:36. This was a fast course. There was a few “no passing” zones on the course, which did cause some slow down. But it’s all for safety and everyone needs to remember that, especially the guy that bumped me as he flew by in the “no passing” zone. I was hitting 28-30mph in some areas, which was nice. It’s a 2-loop course that takes you over the 14th street bridge and through a few tunnels. There are a few uncomfortably tight turns on the course where it’s best to slow down to a crawl to be safe. I felt really good about my bike course time, I wouldn’t change a thing. Finished in 1:13:16 giving me a 20.3mph average pace, I’ll take it. I came in quickly off the bike I was not looking forward to the run. Time 1:50. By this time it had gotten really hot, temperatures were in the 90s. It was humid and there was not a cloud in the sky. I have been running poorly in the heat, and this was not going to be a good run. I started the run with a slight cramp in my side, which I was able to work out fairly quickly. There wasn’t a lot of shade on the course, and it’s a good thing that I didn’t have the urge to go because there weren’t any porta-johns either. The course had a few slight inclines, but for the most part was fairly flat. It wasn’t muscle cramping or lack of energy, I just couldn’t cool off enough. Finished in 55:35 at 8:58 per mile. Very unhappy with my run time. 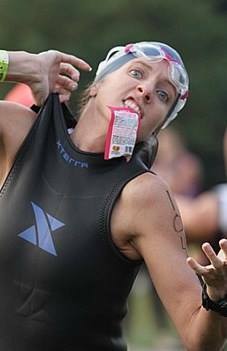 My overall experience with the Nation’s Tri was awesome. The race was well organized, from packet pickup through the finish line. 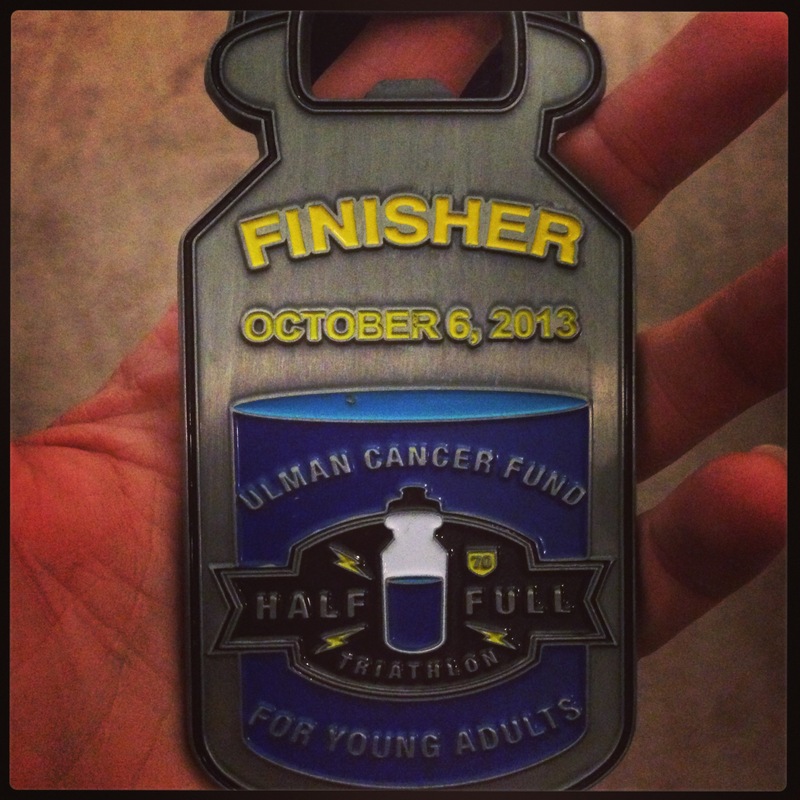 Unfortunately, after the finish line not all racers received their finisher medal right away. Some how they ran out of medals and had to mail out many of them. 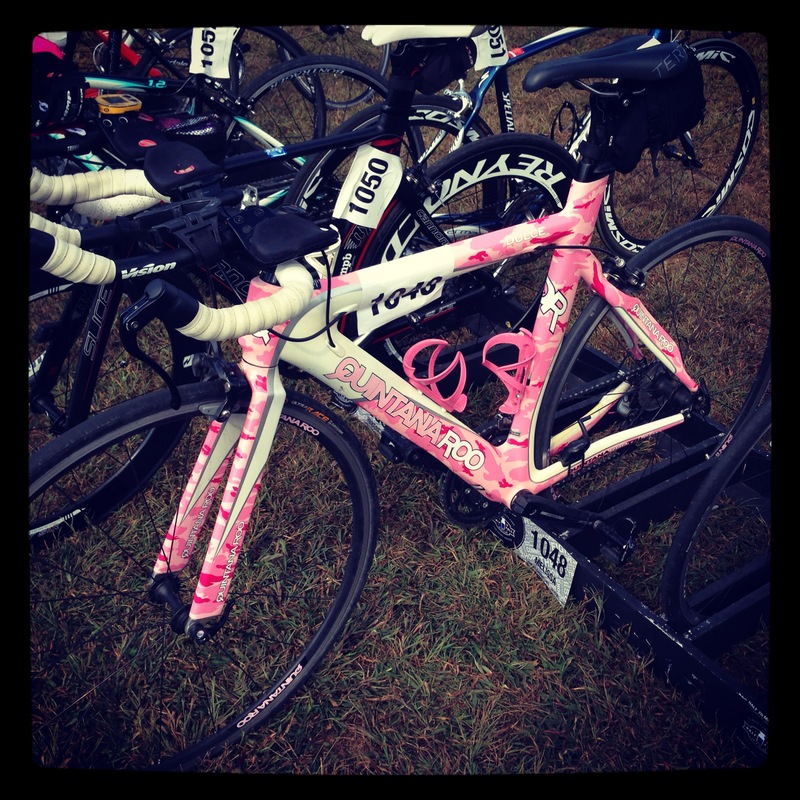 This entry was posted in Triathlon and tagged bike, Events, Gatorade, Leukemia & Lymphoma Society, Multi-Sports, Nation's Tri, run, Sports, swim, triathlon, United States, Washington DC, Washington Hilton on October 19, 2013 by usmctriwife. ‘Million Vet March’ Descending on Nations Capitol Demanding Memorials Open. This entry was posted in Military on October 12, 2013 by usmctriwife. What It’s Like For Girls At The Gym [Video] | Intern John. 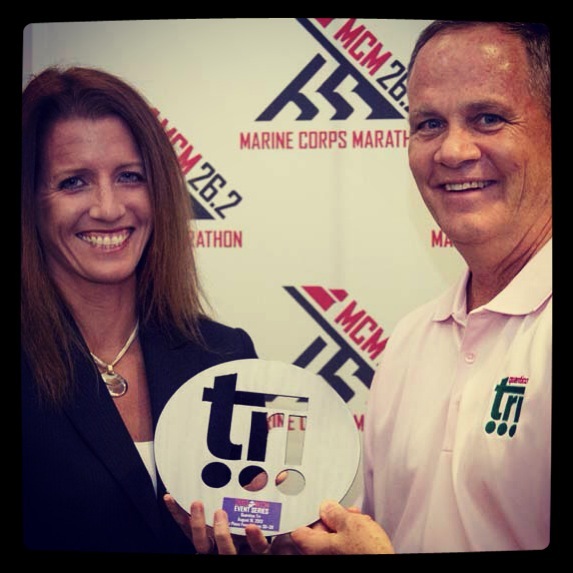 This entry was posted in Healthcare, Triathlon and tagged gym rat, training, tritraining, workout, yoga on October 3, 2013 by usmctriwife.